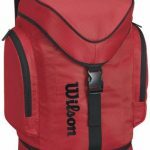 While testing Wilson Evolution Basketball Backpack, we found out that you can get a really good basketball backpack for a really affordable price. In the less than $50 price range, we really didn’t expect to find a top tier product that offers great functionality and excellent design. 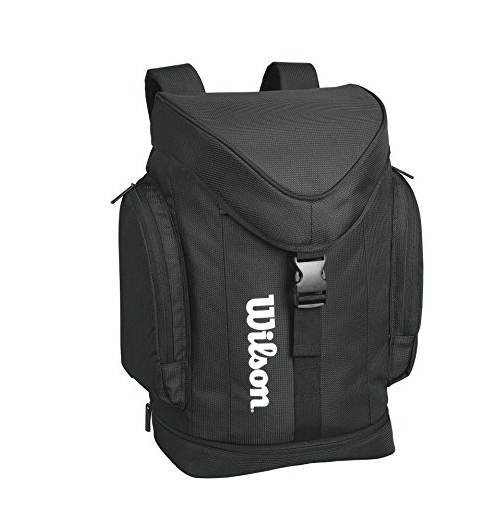 The spacious main compartment can easily hold your ball and shoes and it has a padded sleeve for your laptop. 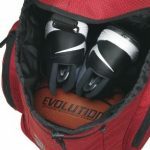 The competition is stiff in this category and we thoroughly tested if Evolution Basketball Backpack can hold up the candle to its competitors. For a regular sized backpack, this is one of the best products we reviewed in a while. The reason for it lies in the fact that no space is wasted. For example, the bottom side is used for storing your wet gear and there is no need for the main compartment split on account of that. The result is more than impressive and you can fit a ball and shoes with room to spare. There is a top pocket for your phone and wallet and side pockets for water, headphones and other stuff you might want to put in there. Usually, the products in the mid-price range compromise in this segment and don’t offer great durability. Not the case with Evolution Basketball Backpack! The build quality is excellent and reading user testimonials, we came to a conclusion that although it is affordable, this backpack is by no means of poor quality. It should serve you well for at least a couple of years. The material is quite rigid and it will keep your gear dry against the moderate rain or snow. This is perhaps one of the best qualities of this product. We simply love the way this backpack looks, and it has some clever design features which adds ergonomics of use. The way a top cover protects a small pocket where you keep your valuables is just an example for the level of details incorporated in the design. This product comes in three color variations, all of which look amazing. We rarely like the product just based on its looks, but this is certainly one of them. If the looks aren’t enough of a reason for you to buy this backpack, the pricing will certainly be! You can get this backpack in under $50 and the price doesn’t vary much with color variations. With all the usability and the quality of build, not to mention the looks, this is one of the best value for money ratios you can find on the market today. Evolution Basketball Backpack offers an excellent alternative for higher priced products in the segment, without compromise, and affordable to anyone. The average user rating for this backpack is 4.8 stars out of 5. That should paint a picture for you.